As the Interior Department considers unprecedented changes to protected lands, avenues for public input have been curtailed. Interior Secretary Ryan Zinke likes to talk about listening. 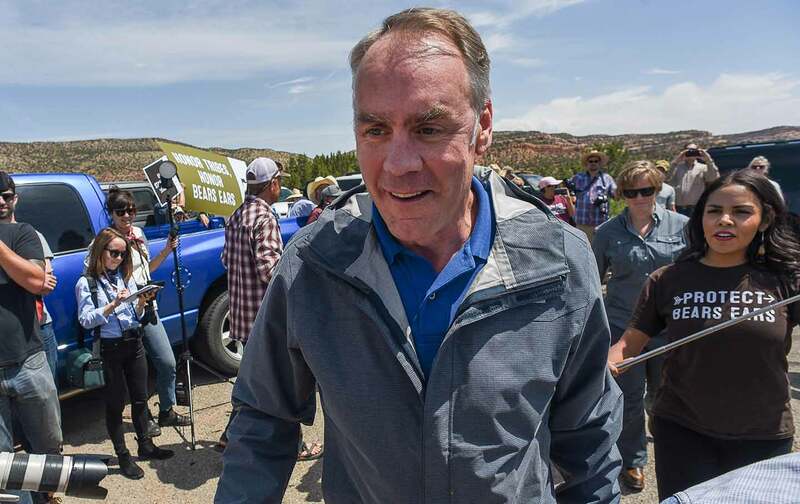 “This is the first time in a monument that we’ve given the public a say,” Zinke claimed last week during a swing through Utah to inspect the Bears Ears and Grand Staircase-Escalante national monuments. “I’m in listening mode,” he said at another point in the trip. Those monuments, along with more than 20 others, are the subject of a review ordered in April by President Trump, who indicated that he will consider diminishing or revoking their protections. Zinke describes the review as a chance to hear from local people overlooked by Washington bureaucrats. “Finally, rural America has a voice again,” he declared when Trump ordered the review. But Zinke has not made it easy for the public to participate in the review process—in fact, in some ways he’s made it more difficult. As The Salt Lake Tribune reports, Zinke held no public meetings during his Utah trip, in contrast to his predecessor Sally Jewell, who held a four-hour meeting prior to the designation of the Bears Ears monument, with more than 1,000 in attendance. Zinke met with pro-monument and Native American groups for less than two hours, while he traveled “extensively” with prominent members of the anti-monument camp throughout his four-day trip, which was largely organized by Republican Governor Gary Herbert, a critic of the monuments. The Bears Ears monument, in an area of historical and cultural importance to several Native American tribes, is the most contested of those under review. Establishing it took six years of work. In contrast, the public comment period DOI opened as it considers rescinding its protections lasts just 15 days. (It ends May 31.) In a letter sent recently to Zinke, New Mexico Senator Martin Heinrich wrote that the narrow window provides communities with an “extremely limited time” to weigh in, particularly those without reliable Internet access. Relying solely on comments submitted through the department’s website “is unequal and heavily weighted toward urban, non-Native communities—those least affected by the decision of whether to shrink or repeal the Bears Ears National Monument,” Heinrich wrote, noting that over three-quarters of New Mexicans and Utahns living in Indian Country do not have access to fixed broadband. If Zinke and Trump do try to make changes to existing monuments, it’s certain they’ll be challenged in court. But the way the review process unfolded is troubling on its own. Shortly after Trump was elected I asked several conservationists how his administration might change the management of public lands. Along with the prospect of escalated fossil-fuel production, they were concerned that Trump’s team would try to limit public participation in decision making. “The biggest threat is to how decisions about our public lands are managed. The public say in that process is very much at risk,” Sharon Buccino of the Natural Resources Defense Council told me at the time. Less than six months later, her concerns hardly seem unwarranted.